In F1 2002, kick off a brand-new season of racing with all the speed, glamor, and rivalry of Formula One. 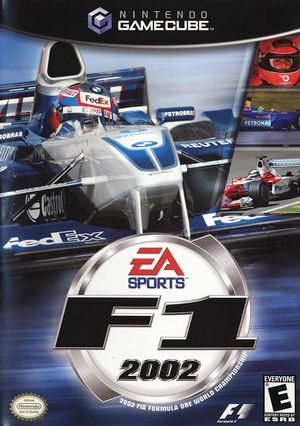 Officially licensed from the Formula One Administration Limited, F1 2002 features real drivers, teams, cars, and tracks from the 2002 FIA Formula One World Championship. Join new teams--Toyota and Renault--and complete all-new challenges that test your driving skills. The higher you place in each race, the more points you receive, and the closer you are to the Constructor's Cup. This game takes a very long time to load (90+ seconds) and has no feedback during the initial chunk. The load times on console are only about 15 seconds, so this is a defect in Dolphin. As of 4.0-5394, the EA Sports logo during the intro can stutter/freeze using default settings. Setting Texture Cache Accuracy to Medium (middle position) or Safe (left position) solves the issue. The graph below charts the compatibility with F1 2002 since Dolphin's 2.0 release, listing revisions only where a compatibility change occurred. This page was last edited on 27 December 2017, at 06:13.